We have 4 floors and a basement dedicated to providing you a stay worthy of this wonderful city and the beautiful country beyond. We want to make you feel like family, like buddies at uni and mountain expedition mates all at once. Adventure, chill, parties, talking about life, events, pub crawls and hikes, even a bike... it's all here! 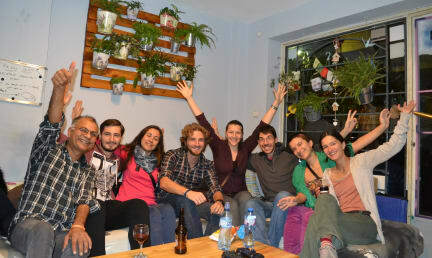 The hostel is located in a safe, relatively quiet district on the edge of the centre of Sofia, 15 minutes walk from the main old centre and the attractions there. Very local to us is the beautiful South park, as well as frequent public transport links to Vitosha mountain and other parts of the city. For food and drink we have supermarkets, markets, restaurants and bars nearby. The hostel is decorated by many different artists and contributers to provide an interesting enrivonment and a relaxing atmosphere - we welcome new contributions to this art space. The rooms are fresh and clean, with metal framed, sturdy beds and high quality mattresses. Many of the rooms, including our main dorm, have a balcony and plenty of light. We strive to provide a clean and hygenic environment, quality facilities that are diligently cleaned every day. Our main objective is to be somewhere different, that becomes a special part of your trip, whether as a holidaymaker or a backpacker, and we hope the warm welcome we extend to you allows you to have the maximum greatest time possible here in Sofia. One more thing we can mention are our regular activities. There are frequent board game nights, movie nights (with drinking games), family dinners, amazing pancakes for breakfast (if we are in the mood, of course), and so on. We promise we will do our best to make sure you enjoy your stay with us. If cancelled or modified less than 2 days (48 hours) before arrival or in case of no-show, the cost of the first night's stay will be charged. Payment upon arrival by cash or by credit/debit card. We are very sorry but the construction of the building makes us inconvenient for disabled people. Solid smaller hostel experience. The staff are legends. We stayed in a private room on the third floor. It had great staff and a nice kitchen. It is around a 20 minute walk from the downtown core. The room was nice. The pillow wasn’t the best and the room was kind of damp/cold. But overall, we had a very good time at this hostel. Good hostel at a great price. Very chilled with a nice common area to hang in until 11. It’s about a 30min walk to the centre. Would stay here again. A very pleasant experience, would definitely come again. Laura and the rest were great "staff", they volunteer there and are travellers so there is a chill atmosphere while they still manage the hostel. Would visit again as it's social but no party hostel. 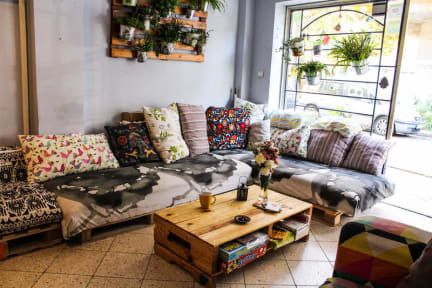 Worth the walk from town, this hostel has the best vibe of the hostels we stayed in Sofia. The staff were great, very friendly and knowledgeable and if they didn't know the answer they would go out of their way to find out for you. The beds were comfy and clean, the bathrooms however could do with some work, particularly the showers.